Arrow Ceiling was established in 1987. Our company is known as the popcorn ceiling removal and repair experts in Tarpon Springs Florida, our company specializes in small, medium and large popcorn ceiling removal projects! Arrow Ceiling is dedicated to bringing you the best performance at the best price! We have an established reputation for on-time and on-budget performance, quality workmanship, and most importantly, satisfied clients! If you are looking for a company that specializes in popcorn ceiling removal and repair with a lot of experience under their belt, you have come to the right place! Dont forget, we can also paint your ceilings after we remove or repair the popcorn ceilings and apply the finish texture. 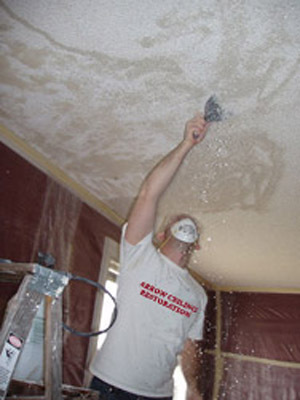 If you're looking for a Tarpon Springs Ceiling Contractor Specializing in Popcorn Ceiling Removal, Popcorn Ceiling Repair, Drywall Repair, and Texture Ceilings and Walls, contact Arrow Ceiling Restoration today at (727) 804-5411, or complete our estimate request form.